There's something so fancy about scones! They are perfect with tea or coffee and are a great addition to any breakfast or brunch spread. Serve them up with some freshly made bacon and eggs for a completely decadent meal! Combine the beauty of a scone with the dreaminess of pumpkin spice, YES PLEASE! PSLs, you might love them or hate them, but there's no denying, these scones are delicious! 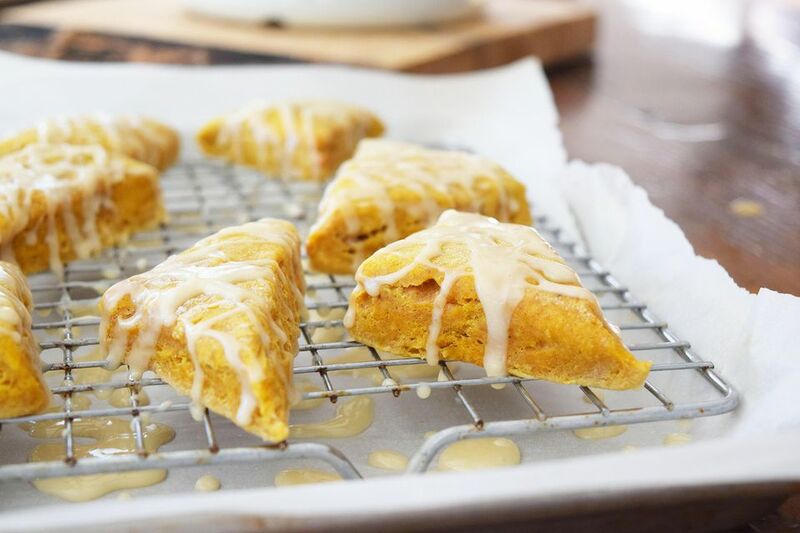 These slightly soft and melt in your mouth pumpkin scones are super easy to whip together. This recipe makes a small batch of scones, but if you cut them up into smaller triangles then you will have tons of bite-sized beauties! The easiest way to cut them is to roll out the dough into a large rectangle. Cut out rows and then columns so that you have squares. Cut each of those squares on a diagonal to make little triangles! You can also roll the dough into a circle and cut it like a pie. The key is to not over work the dough, so that the pockets of butter will only melt when cooking! The glaze for these scones is also very simple to mix together. The maple syrup adds great flavor. You can also make the glaze without the maple syrup; just add in 4 more Tablespoons of milk instead! You can drizzle the glaze on the scones or you can dip them right in that goodness! Preheat your oven to 400 degrees. If you have a convection setting, use it! Combine all of the dry ingredients together in a large bowl. Incorporate butter with a pastry blender or your hands and mix until it becomes coarse crumbs. Be careful not to over blend, or to get the butter too warm if you are using your hands. Whisk the wet ingredients together and add them to the dry. Knead slightly to form a soft dough. Roll out dough on a clean, floured surface into a 1/2 inch thick rectangular sheet. Cut into squares, and then diagonally into triangles. Place each scone on a parchment lined baking sheet. Bake for 10-12 minutes or until a toothpick comes out clean. Let cool the scones cool on a cooling rack. You may store in an airtight container, but only if they are completely cooled!